J. Schmidhuber. Turing in Context. Science, vol 1638, p 1639, 2012. Plus comment on response by A. Hodges. J. Schmidhuber. Turing: Keep his work in perspective. Nature vol 483, p 541, 2012. J. Schmidhuber: Colossus was the first electronic digital computer. Nature 441 p 25, 2006. J. Schmidhuber: Turing's impact. Nature 429 p 501, 2004. See below! 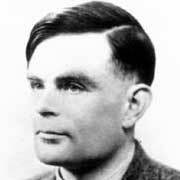 Alan Mathison Turing reformulated Kurt Goedel's unprovability results in terms of Turing machines (TMs) . Closely related earlier work was done by Turing's advisor Alonzo Church. TMs subsequently became the most widely used abstract model of computation. Universal TMs can emulate any other TM or any other known computer. During World War II Turing helped (with Welchman) to decipher the Nazi code, extending earlier work by Polish mathematicians. Some sources say this work was decisive for defeating the Third Reich. Later Turing suggested his famous test for evaluating whether a computer is intelligent (more on Artificial Intelligence history). Computer science's most sought after prize carries his name: the Turing award. 1936: most famous paper at age 30 . 1939-1942: Bletchley Park, helping to decode the Luftwaffe's Enigma code.
. A. M. Turing. On computable numbers, with an application to the Entscheidungsproblem. Proceedings of the London Mathematical Society, Series 2, 41:230-267, 1936. The letter below appeared in Nature 429, 501 (03 June 2004); doi:10.1038/429501c; © Macmillan Publishers Ltd.
Sir - John L. Casti, in his fine review of Alan Turing: Life and Legacy of a Great Thinker, edited by Christof Teuscher ("Touring artificial minds" Nature 428, 258; 2004), proposes that Turing had more impact on everyday life than the man named by Time magazine as Person of the Century, Albert Einstein (Time 154, 27; 1999). Casti suggests that Turing's 1936 paper provided the "theoretical backbone" for all computers to come. Although Turing, a hero of mine, certainly was one of the greatest, we should keep in mind that his paper essentially just elegantly rephrased Kurt Gödel's 1931 results and Alonzo Church's extension thereof. It did not have any impact on the construction of the first working program-controlled computer. That was made in Berlin by Konrad Zuse in 1935-1941 and was driven by practical considerations, not theoretical ones. In fact, the greatest impact that Alan Turing made on daily life was probably through his contribution to cracking the Enigma code, used by the German military during the Second World War, which is sometimes cited as a decisive event of the war. But who was really the most influential person of the 20th century? It was none of those mentioned in the letter to the left: neither Einstein nor Gödel nor Turing nor Zuse . And it was neither Hitler nor Gandhi, for that matter. At least scientists know that the most influential TwenCen persons were Fritz Haber & Carl Bosch. Never heard of them? They were the ones whose invention jump-started the population explosion - billions of people would not even exist without the Haber-Bosch process.